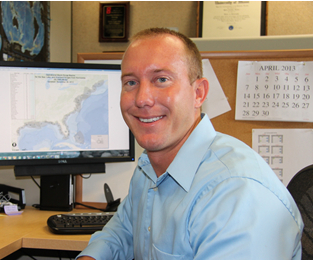 Q & A with NHC - Brian Zachry, Ph.D. The Storm Surge Unit (SSU) continues to expand and evolve. What is your role? Aside from operations, my role is to help advance our modeling capabilities and provide support for GIS activities. This is a really exciting time for the SSU. The talented team we have in-house and better computing resources now being made available enable us to make significant modeling and technical advancements. We envision making leaps and strides within the arena of operational storm surge forecasting. We use the Sea, Lake, and Overland Surge from Hurricanes (SLOSH) model operationally at NHC. Currently, I am getting everything set up on a supercomputer in Boulder, CO so we can perform more and faster storm surge simulations. We're building larger and higher resolution grids, so we need access to a supercomputer that can handle them efficiently. For each new basin, we will create products called Maximum Envelopes of High Water (MEOWs) and the Maximum of Maximums (MOMs). More than fifty thousand simulations are needed to create these per basin and you can't do that on a PC. These are all different scenarios at different locations? That's correct. Imagine parallel tracks of hurricanes making landfall a few miles apart for all possible directions of motion. Then, for each of the storm tracks, vary the maximum sustained wind speed, forward speed of the storm, the radius of maximum winds, and the tide anomaly – all of the uncertainty that comes within a forecast is built into the MOMs and MEOWs. Who are these products aimed toward? These are geared largely for the emergency management community in building the evacuation zones. They provide an initial estimate of the flood zones and then emergency managers can put these footprints on an overlay — combined with their regional expertise — to decide where the zones should be placed. Many people don't realize that evacuation zones are based on water, not wind. When you say the word hurricane to someone, the first thought is wind. But that's not the problem. It is definitely not the only problem — storm surge is the leading cause of loss of life during a tropical cyclone landfall. I've studied wind and water extensively and can see it from both sides. When I talk with my Grandma in Daytona Beach, she is always worried about the wind. Now that I've been in the field, she is concerned about water, too. I think if you live along the coast, you've always been aware of storm surge but you may not be aware of its impacts and your specific vulnerability. It is important to know that people who are inland can be just as vulnerable to storm surge flooding as those along the immediate coastline. Did (2012's) Sandy change the equation? I always avoid saying that big storms changed the equation — we are constantly learning and evolving from past experiences. That's the uncertainty of weather. If you think about storms like Ike, Katrina, and Irene, they put more emphasis on storm surge and the need for us to have better communication of storm surge impacts. Sandy was another one of those storms that proved this need. By 2015 we plan to have a watch/warning specific for storm surge and a graphic showing inland inundation. Did you have the weather bug when you were young? As far back as I can remember. My dad has always been into the weather and he passed that onto me at a very young age — he wasn't a meteorologist, but he always talked about and was fascinated by the weather. I grew up in Florida, where you can either be impacted by the weather or you can forecast, plan, and be prepared for it. I chose the latter, and was hooked. Once you have the weather bug, you can't stop it. I have the ocean bug, too. I caught this one a little later, and it stemmed from my general love for the ocean. I went to college at Florida Tech in Melbourne and received my Bachelor's degree in Meteorology & Environmental Science. They have a great multidisciplinary program because it mixes meteorology with some oceanography. I found that I really enjoyed the academic and research fields. I wanted to learn more about hurricanes and their impacts, which is why I went to Texas Tech University to get my Ph.D. in wind engineering. Their program and courses are one-of-a-kind. How does wind engineering lend itself to water? At Texas Tech, I found myself focusing on how hurricane winds change as they transition from sea to land. This is very important for coastal building codes. Intuitively, I wondered what happens when you apply this offshore to where the waves transition from deep water to the coast. This very small layer where the wind and water respond to each other is called air-sea interaction. That's where it all started and how I got involved with storm surge. To learn more about this, I was involved in field projects placing wind gauges at the coast and dropping storm surge gauges from a helicopter for notable Hurricanes such as Gustav and Ike. It's quite a thrill hovering just above the ocean with very large waves below. How'd you end up at NHC? If hurricanes are your passion, NHC is the place to be. Ever since I was young, I always wanted to work at the hurricane center. The opportunity came up, I jumped on it and here I am. It has to be cool to be part of the many exciting things coming up in storm surge. It is, and that is one of things that really brought me to the SSU. There are so many changes that are going on right now – the emphasis is now on storm surge. The National Hurricane Center has always been the center of everything hurricane related but storm surge has been kind of branched out. Now we're trying to make it a focal point here in a really expanded role. I thought it's a great time to join with new inundation graphic coming, the new storm surge warnings, and the new modeling advancements we're going to tackle. There is a lot of work to be done and it's a really exciting time. What is the greatest challenge in getting the public to think of the water in a hurricane? Communication — clear, concise communication of the storm surge hazard and its impacts. There has been some confusion in the past as to what datum we were talking about and if there is a storm surge scale. We're getting away from all that confusion now and as (NHC storm surge team lead) Jamie Rhome likes to say — we have a storm surge scale, it's called feet. Everybody can understand what five feet above local ground level is, stand outside and measure five feet up from the ground. For now, I want to see how everything evolves, how the storm surge unit continues to develop and expand, and we'll just go from there. Can you ever just turn it off? I don't think I can ever just turn it all off. I can turn off the storm surge, but not the weather. I like the outdoors. I play golf, so I am wondering where the sea breeze front is located and when the next thunderstorm will pop up. I also surf, so I am thinking about the waves, how they're generated, the wave period, and forecasting when the next swell will show up — the weather and the ocean are a big part of my personal life. Any advice for someone with the weather bug? If you have the weather bug, go for it. Embrace this passion, learn about it, and teach others. Don't ever stop.